For computers, see Computer virus. A virus is a microscopic parasite which can infect living organisms and cause disease. It can make copies of itself inside another organisms cells. Viruses consist of nucleic acid + a protein coat. Usually the nucleic acid is RNA; sometimes it is DNA. Viruses reproduce by getting their nucleic acid strand into a prokaryote or eukaryote cell. The RNA or DNA strand then takes over the cell machinery to reproduce copies of itself and the protein coat. 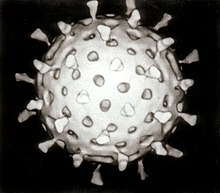 The cell then bursts open, spreading the newly created viruses. All viruses reproduce this way, and there are no free-living viruses. Viruses are ubiquitous (everywhere) in the environment, and all organisms can be infected by them. Viruses are much smaller than bacteria. They were not visible until the invention of the electron microscope. A virus has a simple structure. It has no internal cellular structure, no cell wall or cell membrane, just the protein coat that holds the string of nucleic acid. With eukaryote cells, the virus' protein coat is able to enter the target cells via certain cell membrane receptors. With prokaryote bacteria cells, the bacteriophage physically injects the nucleic acid strand into the host cell. When the host cell has finished making more viruses, it undergoes lysis, or breaks apart. The viruses are released and are then able to infect other cells. Viruses can remain intact for a long time, and will infect cells when the time and conditions are right. Some special viruses are worth noting. Bacteriophages have evolved to enter bacterial cells, which have a different type of cell wall from eukaryote cell membranes. Envelope viruses, when they reproduce, cover themselves with a modified form of the host cell membrane, thus gaining an outer lipid layer that helps entry. Some of our most difficult-to-combat viruses, like influenza and HIV, use this method. Viral infections in animals trigger an immune response which usually kills the infecting virus. Vaccines can also produce immune responses. They give an artificially acquired immunity to the specific viral infection. However, some viruses (including those causing AIDS and viral hepatitis) escape from these immune responses and cause chronic infections. Antibiotics have no effect on viruses, but there are some other drugs against viruses. Viral populations do not grow through cell division, because they do not have cells. Instead, they use the machinery and metabolism of a host cell to produce many copies of themselves, and they assemble (put together) in the cell. Attachment is a specific binding between viral capsid proteins and specific receptors on the host cellular surface. Penetration follows attachment: Virions (single virus particles) enter the host cell through receptor-mediated endocytosis or membrane fusion. This is often called viral entry. The infection of plant and fungal cells is different from that of animal cells. Plants have a rigid cell wall made of cellulose, and fungi one of chitin. This means most viruses can only get inside these cells by force.70 An example would be: a virus travels on an insect vector which feeds on plant sap. The damage done to cell walls would let the virus get in. Uncoating is a process in which the viral capsid is removed: This may be by degradation by viral enzymes or host enzymes or by simple dissociation; the end-result is the releasing of the viral nucleic acid. Replication of viruses involves multiplication of the genome. This usually requires production of viral messenger RNA (mRNA) from "early" genes. This may be followed, for complex viruses with larger genomes, by one or more further rounds of mRNA synthesis: "late" gene expression is of structural or virion proteins. Following the structure-mediated self-assembly of the virus particles, some modification of the proteins often occurs. In viruses such as HIV, this modification (sometimes called maturation) occurs after the virus has been released from the host cell. Viruses can be released from the host cell by lysis, a process that kills the cell by bursting its membrane and cell wall. This is a feature of many bacterial and some animal viruses. The genetic material within virus particles, and the method by which the material is replicated, varies considerably between different types of viruses. The body's first line of defence against viruses is the innate immune system. This has cells and other mechanisms which defend the host from any infection. The cells of the innate system recognise, and respond to, pathogens in a general way. RNA interference is an important innate defence against viruses. Many viruses have a replication strategy that involves double-stranded RNA (dsRNA). When such a virus infects a cell, it releases its RNA molecule. A protein complex called dicer sticks to it and chops the RNA into pieces. Then a biochemical pathway, called the RISC complex, starts up. This attacks the viral mRNA, and the cell survives the infection. Rotaviruses avoid this by not uncoating fully inside the cell and by releasing newly produced mRNA through pores in the particle's inner capsid. The genomic dsRNA remains protected inside the core of the virion. The production of interferon is an important host defence mechanism. This is a hormone produced by the body when viruses are present. Its role in immunity is complex; it eventually stops the viruses from reproducing by killing the infected cell and its close neighbours. Vertebrates have a second, more specific, immune system. It is called the adaptive immune system. When it meets a virus, it produces specific antibodies that bind to the virus and render it non-infectious. Two types of antibodies are important. The first, called IgM, is highly effective at neutralizing viruses but is produced by the cells of the immune system only for a few weeks. The second, called IgG, is produced indefinitely. The presence of IgM in the blood of the host is used to test for acute infection, whereas IgG indicates an infection sometime in the past. IgG antibody is measured when tests for immunity are carried out. Another vertebrate defence against viruses is cell-mediated immunity. It involves immune cells known as T cells. The body's cells constantly display short fragments of their proteins on the cell's surface, and, if a T cell recognises a suspicious viral fragment there, the host cell is destroyed by killer T cells and the virus-specific T-cells proliferate. Cells such as macrophages are specialists at this 'antigen presentation'. Not all virus infections produce a protective immune response. These persistent viruses evade immune control by sequestration (hiding away); blocking antigen presentation; cytokine resistance; evading natural killer cell activity; escape from apoptosis (cell death), and antigenic shift (changing surface proteins). HIV evades the immune system by constantly changing the amino acid sequence of the proteins on the surface of the virion. Other viruses, called neurotropic viruses, move along nerves to places the immune system cannot reach. Viruses do not belong to any of the six kingdoms. They do not meet all the requirements for being classified as a living organism because they are not active until the point of infection. However, that is just a verbal point. Obviously, their structure and mode of operation means they have evolved from other living things, and the loss of normal structure occurs in many endoparasites. The origins of viruses in the evolutionary history of life are unclear: some may have evolved from plasmids – pieces of DNA that can move between cells – while others may have evolved from bacteria. In evolution, viruses are an important means of horizontal gene transfer, which increases genetic diversity. A recent project discovered nearly 1500 new RNA viruses by sampling over 200 invertebrate species. "The research team... extracted their RNA and, using next-generation sequencing, deciphered the sequence of a staggering 6 trillion letters present in the invertebrate RNA libraries". The research showed that viruses changed bits and pieces of their RNA by a variety of genetic mechanisms. "The invertebrate virome [shows] remarkable genomic flexibility that includes frequent recombination, lateral gene transfer among viruses and hosts, gene gain and loss, and complex genomic rearrangements". A group of large viruses infect amoebae. The largest is Pithovirus. Others in order of size are Pandoravirus, then Megavirus, then Mimivirus. They are bigger than some bacteria, and visible under a light microscope. Viruses are used widely in cell biology. Geneticists often use viruses as vectors to introduce genes into cells that they are studying. This is useful for making the cell produce a foreign substance, or to study the effect of introducing a new gene into the genome. Eastern European scientists have used phage therapy as an alternative to antibiotics for some time, and interest in this approach is increasing, because of the high level of antibiotic resistance now found in some pathogenic bacteria. ↑ 3.0 3.1 Breitbart M, Rohwer F (2005). "Here a virus, there a virus, everywhere the same virus?". Trends Microbiol 13 (6): 278–84. doi:10.1016/j.tim.2005.04.003. PMID 15936660. ↑ Lawrence CM, Menon S, Eilers BJ, et al. (2009). "Structural and functional studies of archaeal viruses". J. Biol. Chem. 284 (19): 12599–603. doi:10.1074/jbc.R800078200. PMC 2675988. PMID 19158076. ↑ Edwards RA, Rohwer F (2005). "Viral metagenomics". Nat. Rev. Microbiol. 3 (6): 504–10. doi:10.1038/nrmicro1163. PMID 15886693. ↑ Barman S, Ali A, Hui EK, Adhikary L, Nayak DP (2001). "Transport of viral proteins to the apical membranes and interaction of matrix protein with glycoproteins in the assembly of influenza viruses". Virus Res. 77 (1): 61–9. doi:10.1016/S0168-1702(01)00266-0. PMID 11451488. ↑ Staginnus C, Richert-Pöggeler KR (2006). "Endogenous pararetroviruses: two-faced travelers in the plant genome". Trends in Plant Science 11 (10): 485–91. doi:10.1016/j.tplants.2006.08.008. PMID 16949329. ↑ Ding SW, Voinnet O (2007). "Antiviral immunity directed by small RNAs". Cell 130 (3): 413–26. doi:10.1016/j.cell.2007.07.039. PMC 2703654. PMID 17693253. ↑ Patton JT, Vasquez-Del Carpio R, Spencer E (2004). "Replication and transcription of the rotavirus genome". Curr. Pharm. Des. 10 (30): 3769–77. doi:10.2174/1381612043382620. PMID 15579070. ↑ Jayaram H, Estes MK, Prasad BV (2004). "Emerging themes in rotavirus cell entry, genome organization, transcription and replication". Virus Res. 101 (1): 67–81. doi:10.1016/j.virusres.2003.12.007. PMID 15010218. ↑ Le Page C, Génin P, Baines MG, Hiscott J (2000). "Interferon activation and innate immunity". Rev Immunogenet 2 (3): 374–86. PMID 11256746. ↑ Greer S, Alexander GJ (1995). "Viral serology and detection". Baillieres Clin. Gastroenterol. 9 (4): 689–721. doi:10.1016/0950-3528(95)90057-8. PMID 8903801. ↑ Matter L, Kogelschatz K, Germann D (1997). "Serum levels of rubella virus antibodies indicating immunity: response to vaccination of subjects with low or undetectable antibody concentrations". J. Infect. Dis. 175 (4): 749–55. doi:10.1086/513967. PMID 9086126. ↑ Cascalho M, Platt JL (2007). "Novel functions of B cells". Crit. Rev. Immunol. 27 (2): 141–51. PMID 17725500. ↑ Hilleman MR (2004). "Strategies and mechanisms for host and pathogen survival in acute and persistent viral infections". Proc. Natl. Acad. Sci. U.S.A. 101 Suppl 2: 14560–6. doi:10.1073/pnas.0404758101. PMC 521982. PMID 15297608. ↑ Canchaya C, Fournous G, Chibani-Chennoufi S, Dillmann ML, Brüssow H. 2003. Phage as agents of lateral gene transfer. Curr. Opin. Microbiol. 6(4):417–24. doi:10.1016/S1369-5274(03)00086-9. PMID 12941415. ↑ Matsuzaki S. et al. (2005). "Bacteriophage therapy: a revitalized therapy against bacterial infectious diseases". J. Infect. Chemother. 11 (5): 211–9. doi:10.1007/s10156-005-0408-9. PMID 16258815. This page was last changed on 8 November 2018, at 17:15.